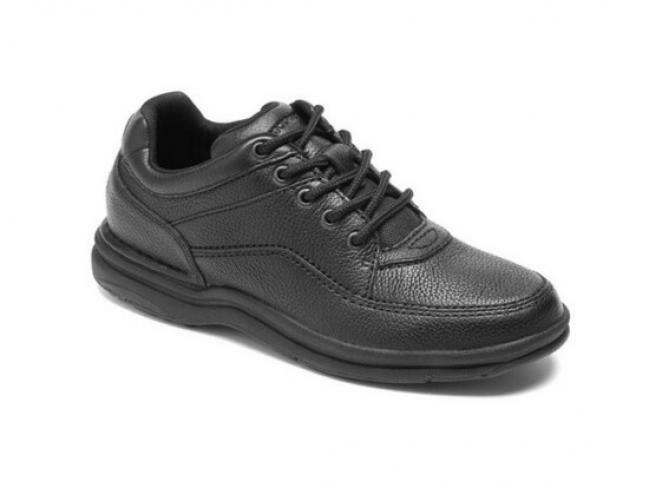 The Rockport World Tour Walking Shoe is one of the most comfortable shoes you will ever wear. Its Rockport Walking Platform offers a wide base of support for heel and forefoot flexibility, while the extra padded tongue protects the wearer from excessive rubbing. The fully grained leather upper of this shoe delivers the ideal blend of durability and style, conforming to your foot over time for the ultimate custom fit. Breathable polyurethane cushioning provides moisture absorbency and odor resistance. Select yours in Black Tumbled or Black Smooth.